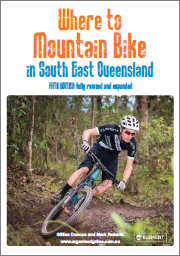 Gillian Duncan and Mark Roberts gave an excellent description of the Noosa Trail Network in the latest edition of their book “Where to Mountain Bike in South East Queensland”. I thought I’d take a couple of friends and explore those trails today. 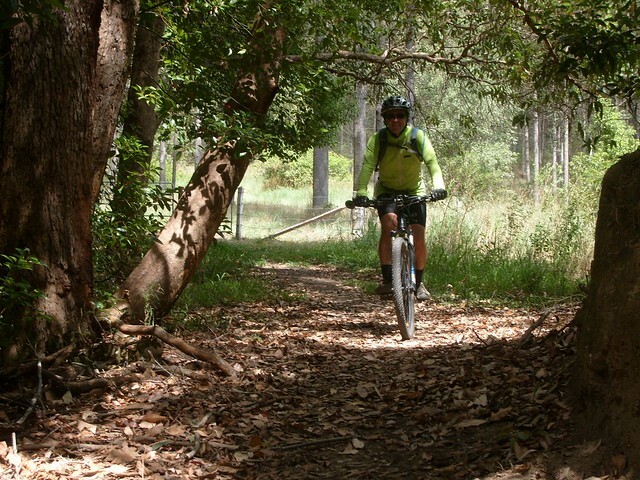 This is the location of the Noosa Enduro – a tough 100km race held every winter along these trails. After riding them, I now have a new appreciation for the hardened competitors that take on this rugged part of the world. We started at the Sunshine Coast Hinterland town of Pomona and headed west through Tuchekoi National Park towards Cooran. 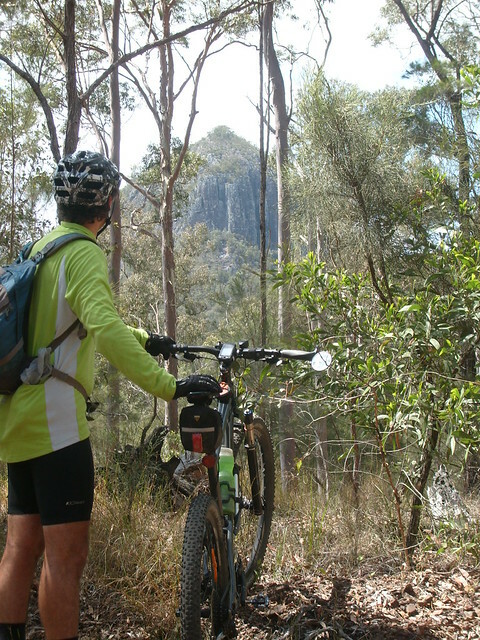 The track took us around Mount Cooroora – a 438 metre high monolith at the centre of the national park. Near Cooran the trail passes through privately owned farmland. This means there are a multitude of gates to open and shut. I think we counted at least 20 on our ride. 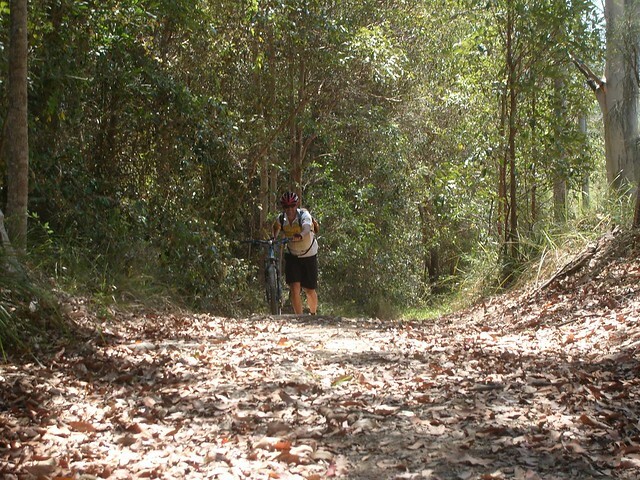 But the trails through the farmland are pleasant, flowing, leaf-littered shady tracks – a joy to ride on a hot day. From Cooran we headed north into Woondum National Park along Tablelands Road. We climbed over 400m in an hour along this road to our high-point in the National Park. It’s a slow climb through lush rainforest, but considering the steepness of the down-hill on the northern side of the park, this is the only way to ride it. There’s no way you could ride up from the north. Many thanks to Paul for giving me this advice before we left! Although it took us an hour to climb 400m, it only took us seven minutes to descend the steep, narrow track through the rainforest on the northen end of Woondum National Park. I’m so glad I had full suspension on my bike – I travelled pretty quickly down some of those rocky sections and the shock absorbers were working overtime. After the descent we had a short break in the shade at Johnstons Lookout which overlooks some of the farmland to the north-west of the small hamlet of Kin Kin. 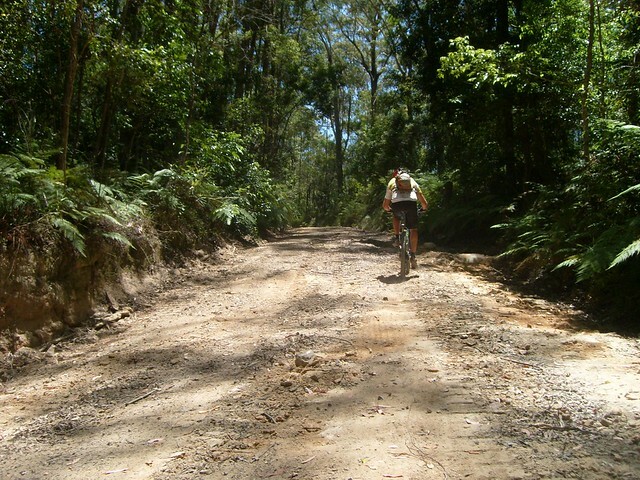 The Noosa Trail Network has a lot of hill climbs like this one along Simpsons Road, east of Kin Kin. 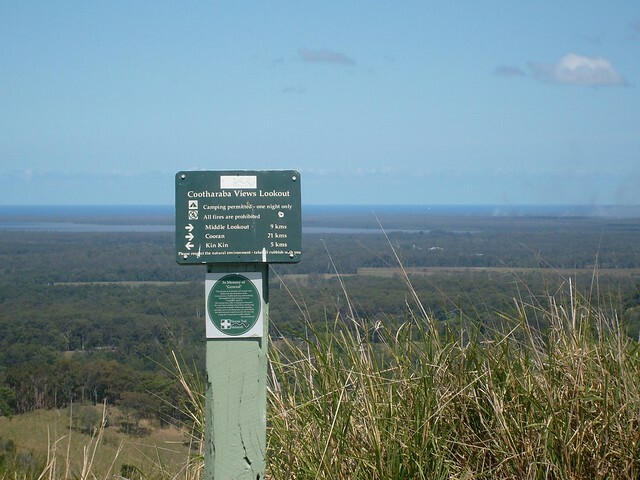 The tough climb up to Cootharaba View Lookout is worth it for the panoramic views. You can see for miles in almost any direction. 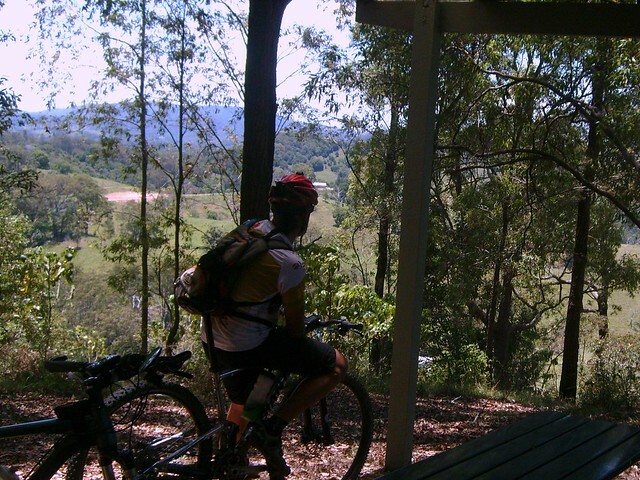 The picnic shelter at the Cootharaba Lookout is a welcome rest-stop after the preceding climb. This ride was just over 60km, but it took us almost 8 hours including breaks. That should give you an idea of the slow-going and tough climbs. I had one puncture along the way because of some of the sharp rocks, but thankfully the “Stans No-Tubes” sealant in my tyres sealed up the hole quickly, so all I had to do was pump up the tyre again and keep going. If you’re going to try this course, don’t expect to average more than 10km/h, which means you’ll need plenty of water. 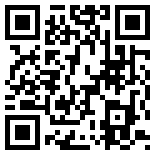 You can re-fill at Cooran and Kin Kin. There are a lot of rocks in places, so make sure you’re prepared for punctures. And the steep climbs mean you’re going to need plenty of high-energy snacks. I burned up about 4,300 kcal, and all-up we climbed a total of about 1,550 vertical metres. On the tough-o-metre this one scores 9 out of 10.